Reduce the time it takes you to cook bacon, but also end up with less greasy results. This high quality rack makes it easy to prepare bacon in your microwave, and actually end up with edible results. Each piece is elevated above the grease while cooking, and positioned vertically instead of lying flat. This advanced design allows for even heat distribution and much better results when compared with other options. Whether you like your breakfast meat tender and juicy or nicely crisp, this handy tool will allow you to get the results you want. In just a few minutes you can have perfectly cooked strips with no pans to wash afterward. The whole thing is dishwasher safe, so instead of hand washing your frying pan after you eat, you can just toss the whole thing into your dishwasher and let it do the work for you. A single rack can make up to 12 pieces at once, or you can stack two racks for twice the capacity in the same amount of time. When you cook your bacon on the stove, it requires quite a bit of time and effort. For this reason, many of us only prepare it for special occasions. Common annoyances will include scalding splatters, meat bathed in grease, messy stove tops, mandatory paper towels for already cooked pieces, and the shear amount of attention it takes. You can certainly achieve the finished product you are after when cooking this way, but it will take twice the time, and way more effort when compared to using this rack. When you also factor in the cleaning that will need to be done afterward, the differences become great. You don't need to slave over a hot stove, or dread the mess it will create just to enjoy a delicious breakfast. With this handy bacon cooker, set up takes seconds, and in just minutes you can enjoy fresh, crispy bacon whenever you want. Because the grease drains as it cooks instead of absorbing into the meat, it will be a healthier alternative that saves you time, and allows you to treat yourself more often. Other microwavable trays and racks available will not produce the same kind of results that this one will. Most are nothing more than a flat tray with some waves built in, so you will still be cooking your bacon in a pool of grease. Because air and heat can not circulate as well on these types of cooking devices, you will not get the same evenly cooked results, and it will be much more difficult to prepare your meat the way you want it. You will save time with these trays when compared to cooking in a pan, but uneven, and rubbery results are pretty common. There are other microwave bacon racks out there, and those will be a bit better than the trays because your strips will not have to cook in grease, and the heat will disburse more evenly. Results should be a bit better than on a tray, but those other racks have a smaller capacity when compared to this one, and there is no option for expansion. Because the meat just sort of hangs there instead of being secured in place, it can slip while cooking which will create some pretty awful results. This rack is thicker and more durable than the alternatives out there, and it is able to cook more bacon with a better finished product. The clever design lifts and separates the strips, but also secures them in place. All sides are exposed to heat for even cooking, and no portion will be submerged in grease. With this easy to use tool, you can quickly cook bacon that is actually crispy, and you will be surprised at how simple it is. Using this microwave bacon cooker rack is super easy. With this tool, anyone can cook it to perfection in a matter of minutes, and all of the dangerous, annoying, or messy stuff will be avoided. To set up the rack, simply take your desired number of strips and then insert them into the slots, one at a time. Each slot or row will hold one piece, and the tray can accommodate up to 12 pieces total. You can cook a single piece or fill it to capacity, and the results will be the same. To cook twice as much, simply use two racks and stack them on top of each other. Once you have inserted your meat, take the two skewers and stick them into their slots which align perpendicular to the bacon. The skewer will penetrate the meat in order to hold it in place while it cooks. After the skewers have been inserted, simply pop the tray into your microwave and proceed to cook. The time and temperature will vary depending upon how tender or crispy you want your bacon, as well as the power rating of your microwave. Start with less time and then add more until you get the consistency you are after. The first time may take a little experimentation, but after that, you should be a pro. Once cooked, simply lift the skewers to remove all of the finished meat at once. Tip skewers over plate to slide your crispy strips down and off. To clean, simply dispose of any collected grease, and then put in the dishwasher. No more messy counters or splattered stove tops, and no more sopping up greasy strips with paper towel just to make them edible. No bacon is healthy, but this convenient cooking rack will help you to prepare it as healthfully as possible. It will be far less greasy, so the overall fat content will be reduced. You won't have to take out any pans or wait for them to heat up, and you won't have to hand wash anything when you finish. Because you will cook with your microwave instead of the stove, your house will not heat up and become uncomfortable. Use everyday to make one or two strips for yourself, or combine several racks to increase capacity and make all of those big breakfast more manageable for when company comes over. Don't suffer through another messy morning, and stop thinking that you can only eat bacon at a restaurant. Get this easy to use device, and enjoy the crispy and delicious flavor any time you want. Dimensions 10" x 9.5" x 2.25"
Uses Reduce mess, cut time, eliminate grease and make cooking bacon easy. Prepare crispy or tender bacon strips in your microwave oven. Material Thick and durable, food-safe plastic. Capacity Cook up to 12 strips with a single rack. Stack two for twice the capacity. Max Cook Time Up to 13 minutes. Grease Tray Yes. Unhealthy grease will drip down to collect under the bacon without touching it. Fixing Skewers Yes. For perfect placement and even cooking. Skewers will keep bacon strips in place. Cooking Position Vertical - Meat does not lie flat so it allows for cooking above the grease and even heat distribution. 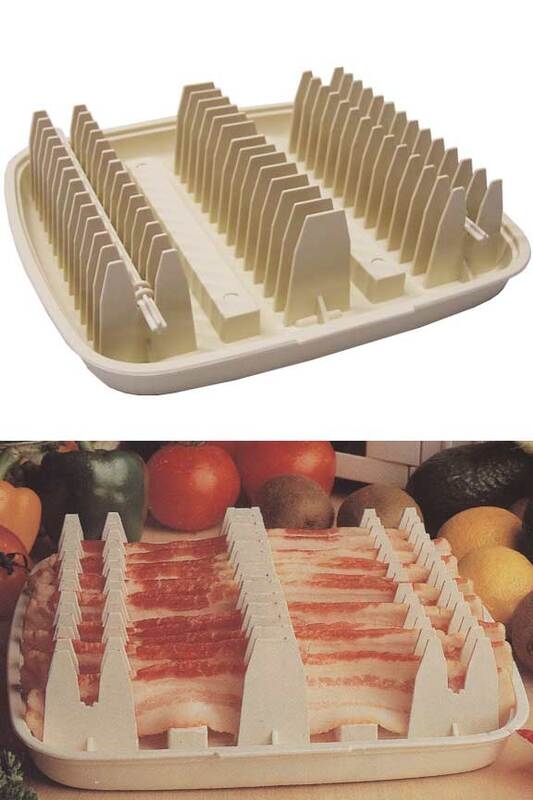 Microwave Bacon Rack - A faster, easier and healthier way to cook bacon. Reduce mess and prepare a less greasy breakfast meat by cooking it in your microwave. This rack will allow you to quickly prepare up to 12 strips just the way you want it. Order Yours Today! Do not even think about comparing this rack with the TV ad model !! The bacon pieces are slightly further apart for better cooking, and holds the longer pieces much better. We have used both models ... the difference is day and night! Absolutely loved these bacon racks. Perfectly cooked bacon every time, with no fussing with cleaning up excess bacon grease. better than pan frying any day. We love our Microwave Bacon Rack. The two skewers that came with are great to keep the bacon straight. Thank you for the follow up. I love the bacon rack. It works great. I like the thickness and it don't think it will warp like some of the others that I had. Microwave Bacon Rack is AWESOME! this amazing product does exactly what it says it will do! Crispy bacon is just a few minutes away, usually about the time biscuits are done! Makes multitasking a breeze! Nice and CRISPY, or just under crispy, whichever you like. PERFECT CHRISTMAS GIFT! He loves it! It's not as messy as his other one and he can cook more bacon on it - which is a huge plus! We really like it! I like the ease of cooking bacon now. The rack is a bit too large for our microwave, so I have to pause cooking and rotate the rack a quarter turn to get the bacon to cook evenly. It worked fine and cleaned up with a bottle brush to catch the nooks and crannies. Love this product! Very sturdy. I love that I can stack two of them. I had previously used one from another place , but it wore out. Highly recommend. 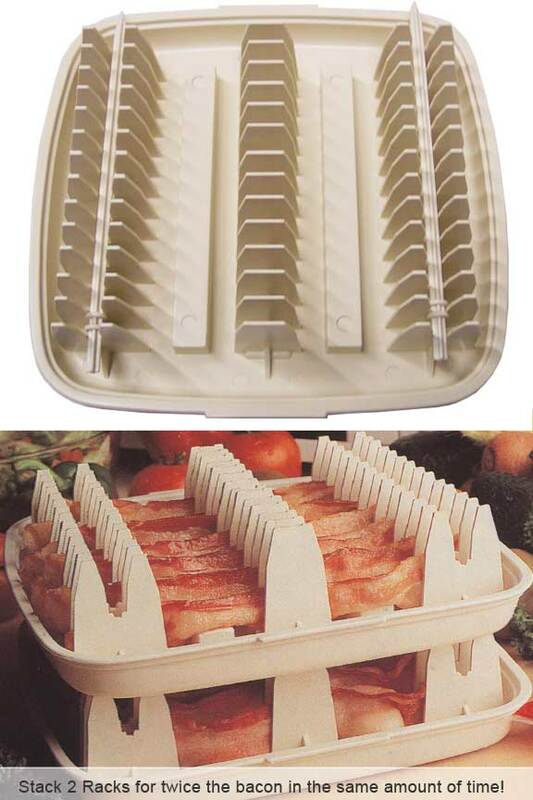 After reading customer's reviews, I decided to purchase this bacon rack for cooking bacon in the microwave. I used it several times and it did cook the bacon evenly quick and without the mess as advertised. I used Oscar Meyer center cut bacon and for four slices, you only need to cook 3 minutes and 10 seconds. Whether it splatter or not in the microwave, I always covered the top with plain paper towel. Saw that some were complaining that the bacon rack tends to warp after putting in the hot dishwasher, I cleaned it in a better way: After dumping the grease in the waste basket, I filled the sink quarter up with hot water with dishwashing liquid and let it soak for a couple of hour. It cleaned beautiful using sponge and rinse it off. I recommended this product. Works great! I am very happy with it, and it saves me tons of paper towels. The sole improvement needed is to make it longer, I need to bend the ends of the bacon so it drips into the pan (i.e., the bcon is loner than the pan it is supposed to drip into. We haven't had it long enough to comment on it's longevity, but as to comparison to the one "As seen on TV", this one seems to be made with sturdier material and, therefore it should last longer. It does a nice job on cooking the bacon and reducing the "shrinkage" of the bacon. It is FANTASTIC!!! Ihad a different brand before...It dtdn't hold up...It warped...This one works GREAT!!! Excellent bacon but a stinker to clean, Bacon slag tends to stick to the bottom of the tray. Could an anti stick be added to the tray or could/would a PAM type product help prevent the sticking? I do the dishes. I had this item for years it just wore out, I guess...finally got this one .. same as before.... great item .... cooks your bacon to however ...I like mine crisp with "NO OIL" ... thats the way it cooks ... "NO OIL OR GREASE" can't beat it !!!!!!!!!!! I have received it and I am very happy this product. We love it. All bacon we cooked in the rack was nice and crisp, just the way we like. Should have a ten star category. About one minute per thick cut slice in the microwave cooks bacon to perfection. To clean, drain grease in garbage can, put in a little Dawn dish detergent, and fill with really hot water, and let stand for a few minutes. Then rinse with hot water and you're ready for the next package of bacon. I bought 2 of these racks and am glad I did. My old bacon cooker was hard to clean but these are quite simple when I drain the grease and then spray the racks with hot water before putting in the dishwasher. So painless on my arthritic hands. The grease does not splatter all over and gets done perfectly. Some years ago, I had a bacon rack similar to this one. I loved that one; really missed it when it went into storage and was lost. This one is very similar to the one I had so long ago and I love it. Bacon cooked in the microwave using this rack is crisp and tasty without the grease of fried bacon. The strips come from the rack straight (or flat) - just right for use in my favorite sandwich, a nice thick BLT! I recommend this cooking accessory to anyone who loves their bacon. Please do your heart a favor and use UNCURED bacon! Thanks. I purchased the bacon wave several weeks ago. I love it, but on the back it says dishwasher safe. Not true. I only put it in the dishwasher one time, yesterday. And it warped so bad I can't use it. Good news is I'm ordering another one. But I will not put it in the dishwasher again. But BAD ADVERTISING PLEASE CHANGE THAT simplygoodstuff response: It is dishwasher safe, but make sure to put it on the top rack, and avoid high heat drying if possible. Do that, and it will not warp. I too enjoy greatly the ease of cooking our bacon. But as others have mentioned cleaning those tight areas not so much fun. And for some strang reason my sticks have melted during usage. I'm afraid that they probably won't last a few more months. I promise you can't live without this little jewel! Fabulous!! I bought one for my daughter and one for myself...how have I ever gotten along without it? The bacon is cooked to perfection. I've rarely made one of my favorite sandwiches, a BLT, because of the greasy mess and hard to clean skillet. Now I have them in an instant any time I want one. OK for some not so good for others. If you are cooking turkey bacon or very thin sliced bacon this product seems to work fine. However thick sliced bacon will not cook completely and definitely does not get crispy. Yes, I've received it 3 weeks ago. ... The only problem I have is washing it. No dishwasher and hard to clean inside the rows. However, I do use it and it's a vast improvement over any other way of cooking bacon. Do not even think about comparing this rack with the TV ad model !! The bacon pieces are slightly further apart for better cooking, and holds the longer pieces much better. We have used both models and as I said, the difference is day and night! This bacon cooker is great.Bacon cooks to a nice crisp with no splatter or mess.The best eleven bucks and change I've ever spent. It does a really good job at cooking bacon, but washing it is time consuming and a royal pain. I'm already trying to find a replacement that is easier to clean. Putting it in the dishwasher is the only way to completely remove all of the grease. simplygoodstuff response: Glad you like the way it cooks. Most people find that the dishwasher is a convenient way to clean, but when hand washing, use hot water and ample soap to help cut the grease and make washing easier. It is the greasy residue that can be difficult, but amount and severity will vary depending upon bacon type. Bacon rack cooks bacon very well. However, washing it and clean-up is difficult as you can't reach into all the crevices. Cooks bacon to perfection. Service and delivery from Simply Good Stuff was excellent. I am happy because my Hubby, the cook, is thrilled with this product. He loves bacon and has tried many,many ways to cook more that a couple of strips at a time in the micro wave and still have crispy bacon. This is it and worth every dime so this little item will be a new gift to give. can u tell me size (?x? ), because my micro is kind of small. thanks! The tray will take up a 10" x 10" space. Does the bacon splatter while cooking? Depending upon fat content, temp and time, you may notice some splatter. How long do I cook bacon in microwave? About 6 bacon slices? Start out with 4-5 minutes, and then add or reduce time based on how your microwave performs. We do not carry spare parts for this item. Sorry. Say I prefer to bake the stuff cooked in a toaster oven or convection up to maybe 325-450 degrees. Can this product stand the heat? Although the rack is microwave safe, we would not recommend putting it in your oven. It may work out just fine, but if the heat is high enough, or you leave it in long enough, it could start to melt. Try this with caution. It has not been tested. The first time I used the baconwave it cracked.Why? Not a positive thing for first time use. Agreed. Too bad you didn't order ours instead. The picture above may look like the bacon wave, but if you get our high quality alternative, it will not crack or fail with your first use, or any after that. Sorry you didn't find us sooner.